If you guys have anything you think I might be interested in adding to the collection shoot me a PM! Wow, what an awesome Orr collection. I actually never knew he was a Blackhawk at the end of his career. I always assumed he was a Bruin for his whole career. That wasn't Bobby Orr, it was some other guy named Orr with ravaged knees. Last edited by Peter_Spaeth; 09-06-2017 at 08:41 PM. And he was still a pretty decent player even with bad knees. I thought he only played a few games in Chicago and then retired. He did only play in 20 games, and might have even missed a year too, I think. From what I recall, when the Bruins wouldn't commit to Orr, Chicago stepped up with a $500,000 per year offer, which may have been the largest annual contract at the time. Great collection, Orr was my first sports hero and still one of my favorites! 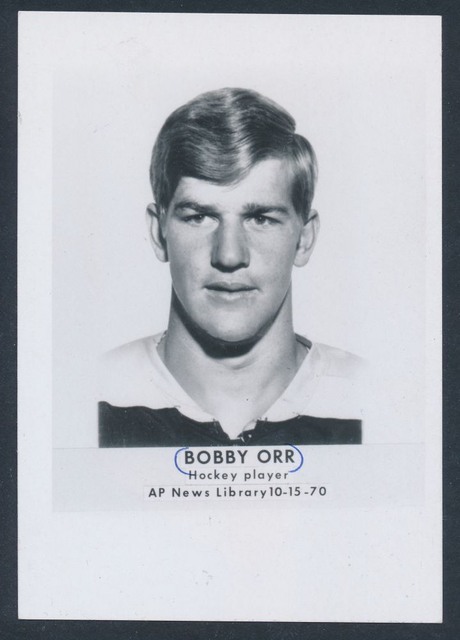 First is a 1970's Bobby Orr Promotional Card that I've never seen before. While it appears to be the same shot of Bobby used in the Rally campaign, the key difference is that this card is black & white (versus the more popular colour version) & the dimensions are smaller (5" x 7" vs. 6" x 9"). This version also has a blank back (the colour version features a printed promo call out for Rally Sports). Sweet! Also grabbed this 1976 OPC Orr card with a crazy print defect that gives the appearance of flames on his jersey. I love the weird stuff! Last edited by jb217676; 12-12-2017 at 07:08 AM. 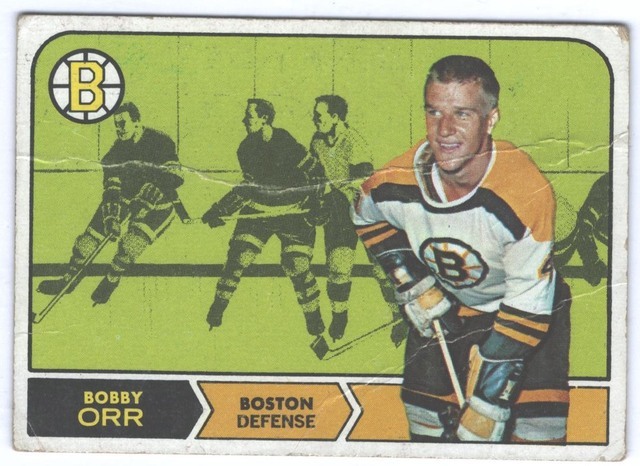 First is a 1970's Bobby Orr Promotional Card that I've never seen before. While it appears to be the same shot of Bobby used in the Rally campaign, the key difference is that this card is black & white (versus the more popular colour version) & the dimensions are smaller (5" x 7" vs. 7" x 9"). This version also has a blank back (the colour version features a printed promo call out for Rally Sports). Sweet! From what I recall, when the Bruins wouldn't commit to Orr, Chicago stepped up with a $500,000 per year offer, which may have been the largest annual contract at the time. No, that's not what happened. The Bruins were willing to commit to Orr; they were even willing to offer him a percentage of the team, but Alan Eagleson, who represented him and was trusted a lot by the family, told Orr that they were not and to just sign with Chicago. Eagleson actually had friends within the Blackhawks organization, so he wanted to do them a favor by giving them Orr. He was a real POS who took advantage of many people. Talk about a short career, he was basically through at 26, in a sport where many of the greats last until their early 40s. Awesome collection of the greatest of all time. Being a New England guy and a Boston sports fan for 50+ years, feel pretty comfortable in saying Orr was the most beloved Boston athlete ever. Ice arenas were built all over N England as a direct result of Orr and the "Big Bad Bruins". Bird, Big Papi and now Tom Brady have all come and electrified the fans and rekindled and increased new fan interest, but they`ll never be another Bobby Orr. Back in the day, "old man alert', you had to actually work to follow the team, late night west coast radio games, channel 38 etc etc as opposed to I phones/red zone channel and 24 hour network T V. Bright candles burn quicker and Bobby was THE brightest. As much as sports titan he always remained humble, accessible and ever the gentleman. To add on to the Eagleson comment, I think I read were Derrick Sanderson, wow the Turk, once asked Bobby why he didn`t take the B`s offer for a % of the team. Orr replied "he(Eagleson) never told me about it". I know Eagleson ripped off/cheated Orr out of millions but does anyone know if Bobby Orr has ever recovered financially, somewhat, from all that? I know he likely isn't hurting for money, at least I hope not, but does anyone know if he has recovered from all that and can now call himself a millionaire? Edit: Found my answer, which I guess I should have just done myself before asking. Last edited by irv; 12-17-2017 at 02:48 PM. Awesome collection. Sad story. So where's the 1971 bazooka? It's on the list, need to come into some SERIOUS cash for one of those! I'm sure Larry would sell you his, Jeff. I think Papi or Bird would give him a run for his money. A lot of people don't follow hockey even in Boston. Here's another addition to my Orr collection. It's a 1969-70 Team Issued Photo Signed by Bobby Orr in vintage ball-point pen. of stars from the left edge of the sheet. Thanks Dale! Here's another cool Orr card I got yesterday. It's a 1971 Topps Bobby Orr card with a Wet Sheet Transfer. I've never seen an Orr card with a wet sheet transfer, grabbed it from ebay as soon as it was listed! Love the 71 error card! I have a 72 Killebrew like that. Very striking. 1970 AP shapshot sized photo. I did get some nice Orr news yesterday: my 1972 that I bought raw at the National got a PSA 7 grade. To be fair though... there's also people in Boston that don't follow or care about basketball. A Boston Globe poll of New Englanders in 1975 ranked Orr as "The greatest athlete in Boston history", and granted, while this did occur at the height of his career, he still topped all-time Beantown legends Williams, Russell, Yaz, Cousy and others. While it's difficult to compare different eras, I'd say his popularity all-time definitely surpasses Bird and Ortiz. The scanner makes it look worse than it is. Last edited by Exhibitman; 05-20-2018 at 01:10 PM. I'm a huge Orr fan, but I'd find it hard to believe that his popularity would rival Ortiz at this point - after the WS championships, his final season and especially his speech after the marathon bombings, dropping the f-bomb and getting away with it and all. And that's not to mention another athlete whose popularity might surpass Orr's, Tom Brady... From my viewpoint, Orr would come after those two. The only problem with this thinking is the fact that Ortiz wouldn't even be the most famous Boston BASEBALL player... With that honour completely owned by Williams. As previously mentioned, the Boston Globe poll found Orr to be even more popular than Williams. And while both Ortiz and Brady are arguably more popular now due to their contemporary careers... as time passes, their stars will fade somewhat. On the other hand, Orr's legacy is completely cemented in Beantown for generations to come. I don't think there's a problem at all, most famous or most popular, I'd be willing to bet that David Ortiz tops Ted Williams for Boston baseball players in a hypothetical poll conducted today. That isn't to say that Ortiz was a better baseball player, just that people would rank Ortiz higher in popularity or fame. And I don't get why the careers of Brady and Ortiz, one which recently ended and the other which is still going, would fade somewhat while Orr's is completely cemented. Both careers of Brady and Ortiz are hardened more than cement, they've been diamonded (if that's a word). One is considered a candidate for GOAT QB who has more rings than any other player, the other broke the silly "Curse of the Bambino," while serving as the face of Boston's more popular franchise. No doubt the hockey fanatics in Boston adore Orr, as do I. But the Sox have historically been more popular, with the Patriots currently running in lead as the most popular Boston sports team in recent years (here's a recent poll to support that: http://www.salemnews.com/who-is-your...fd93802d4.html). Combine the popularity of the Sox with Ortiz's role on the team, his media-friendly personality, the era that he played in (24-hour news cycle), the Boston Marathon speech and recency bias (Orr last took the ice for the Bruins more than 40 years ago and the poll listing him above Williams was taken around that time), I don't think it would be even close today between Ortiz and Orr. The great part is that there is a debate, as these players are all incredible Boston icons and also icons in their respective sports. With all due respect... I find it beyond improbable that Ortiz would be more popular in Boston than Ted Williams... ever, and under ANY circumstance. Except the "GOAT" part, which is more a slight on that corny, completely overused and abused acronym than it is regarding Brady's accomplishments or skill level. GOAT is corny, abused and completely cliche, no doubt, although I'd never outright claim any player deserves it outright - it's always "in the discussion" because I think discussion is more fun. Brady is for sure in that discussion. And I'm not saying anybody being the most popular is "right" or anything, I just know that a lot of people today seem to be fickle enough that they focus on what is new or most recent, especially if they never got to watch Orr or Williams or some of the greats from the past. I wouldn't be surprised if more people in a large cross-section of Boston sports fans could identify Rob Gronkowski than Bobby Orr. Hence popularity or famous, but this includes a wide swath of fans from the general public. And that doesn't mean I'd rank Gronk over Orr, just the opposite on my list, but I'm talking about the overall Boston fandom population today. It was definitely Brady. That I remember. JMO, but I'd put BIRD and Russell up there with Teddy Ballgame, Brady and Orr! Last edited by jb217676; 06-07-2018 at 05:45 PM. 1971 Bobby Orr Autographed Linen Calendar Order Form. A tough Orr piece to locate, happy to find this one on ebay a couple of weeks ago! I'm not a hockey collector or even fan for that matter, but I really love this thread and seeing your collection. My collection is made up mostly of a few in depth player collections, I really appreciate how diverse and in depth your collection goes. Thanks for sharing it! Jeff's collection is something to be envied. Although I love everything he has and would love to own smidgen of it, I am always amazed at his Orr pickups/collection. Last edited by jb217676; 06-18-2018 at 10:29 PM. Found this blue border patch of Bobby Orr on ebay, only blue border variation I've ever seen! I've included a photo of the common yellow border version of this patch offered through the Orr fan club in 1973 for comparison, the history of the Blue border variation is unknown! Last edited by jb217676; 06-23-2018 at 08:47 AM. Another great pick up, Jeff.